SYNCRETIC or not, the BBC erecting an egregious effigy dedicated to its in-house MI5 operative who invented “Newspeak” could not be more apposite as it continues to churn out propaganda for the new cold war order. That’s right, outside the place he claimed to revile and considered “too left-wing” is a nine-foot statue of George Orwell brandishing a cigarette, hand on hip, as if he’s going to fire off an acerbic witticism. You might imagine him as Oscar Wilde, a real revolutionary, republican writer who was imprisoned for the cardinal sin of having a homosexual relationship with the son of the Marquess of Queensberry and singing songs of love for socialism in Reading Jail. Sadly, the former colonial copper was more inclined to kiss the arse of the Establishment because, when push came to shove, he backed his betters before he’d grovel with guttersnipes. Otherwise known as Eric Blair so he could stay incognito when mixing with the masses, he provided the other Blair with an ideal formula borrowed from that nazi fellow — rely on the Big Lie when all else fails. Despite that, Orwell’s character Winston Smith in 1984 was unable to stay true to anybody, including himself. When faced with his most dreaded fears, honesty went out the window and he was grassing up friends, families and colleagues before Senator Joe McCarthy invented it. Remember, no matter the invented chronology, Orwell worked for the Ministry of Information and the BBC from 1940 to compose anti-fascist copy, only to write a short novelette attacking our Soviet allies published one week before the end of the war. So, although, he claims to have left the BBC in 1943 as he couldn’t bear “wasting time and the public money on doing work that produces no results,” he was actually a traitor giving aid and succour to the enemy. I’m disappointed to read yet another rather bitter criticism of George Orwell in the Morning Star (November 13). Orwell was heavily influenced by his experiences and the excesses of Stalin in Spain. “He was also horrified, as were most socialists, by the humiliation and execution of most of the original Bolsheviks. Wrongly, in my view, he went to that other enemy. But the prejudice of some from the old traditions of British communism must not cloud the fact that he was an acute observer of his time and is still read by millions, often in schools. WHEN describing the Soviet Union’s role in the Spanish civil war and George Orwell’s reaction to it, Philip Chambers (M Star November 16) trots out a familiar ultra-leftist chestnut. Phi! should remember that the Soviet Union provided the Spanish republicans with state-of-the-art weaponry and, through the Comintern, organised the International Brigade’s 40,000 volunteers to join the fight against Franco’s fascist forces, supported as they were by the military might of Hitler’s Germany and Mussolini’s Italy. The republican rank and file saw Stalin as a hero and the Soviet people as staunch allies in the struggle to defend their national independence against the threat of fascist militarism. Union for its unstinting solidarity in a speech to the League of Nations. In relation to Stalin’s alleged excesses in Spain, Phil is.probably referring to the crackdown on those forces within the republican movement which staged a counter-revolutionary putch against the Catalonian government. Here the Trotskyist Poum and dissident anarchists turned their weapons against the republican side at a time when the loyalist forces were engaged in a life and death struggle against the fascists. This uprising was swiftly put down by Negrin’s government with the full approval of all sections of Spain’s popular front movement. There were excesses on both sides during the war. There always are in these situations. But they were home-grown and had little to do with the Soviet Union. Orwell’s account of events in Spain is now widely recognised as naive, often dishonest, inaccurate, as well as being politically inept and partisan. Authors like Vinas, Spain’s leading authority on the civil war, Paul Preston and Raymond Carr (not a communist among them) have attested to this. TOM SILBY is right, (many) republicans saw Stalin as a hero and Soviets as allies (M Star November 20). They were mistaken. Orwell’s Homage to Catalonia was a truthful eye- witness account of revolution and counter-revolution. Of course, his was the stand-point of a “decent English gentleman,” he did become an MI5 informer and Animal Farm is an anti-communist “human nature” rejection of all aspirations for universal human liberation from exploitation; hence its place on so many school curriculums. But the execution of all the original Bolsheviks by Stalin at the same time is no lie nor is the role of Italian communist leader Palmiro Togliatti and others in destroying that revolution and slaughtering the Spanish Bolsheviks too. The Republic was not cold in its grave when Stalin signed his infamous pact with Hitler in August 1939, which caused Harry Pollitt so much heartache. Negotiating with imperialism just doesn’t work, Martin Rogan reminds us in the same Morning Star. Tom refers to the “counter-revolutionary putsch against the Catalonian government” (the 1937 Barcelona May Days). Twenty years before in April 1917 one VI Lenin proposed such a “putsch” and faced down the Tom Silbys of his day, Kamenev, Stalin and Zinoviev. He won that argument and so the great October Revolution triumphed. Socialist revolution was the only possible way to assure victory in Russia 1917 and Spain in 1937. Gerry Downing’s letter (M Star November 25) describes George Orwell’s- Homage to Catalonia as a truthful eyewitness account of the Spanish civil war. He goes on to state that Spanish Bolsheviks were slaughtered by Comintern agents. So, Homage to Catalonia is not the honest account that Gerry claims it to be. As for the role that Gerry assigns to Stalin’s agents in Spain, a leading authority says: “The number of NKVD victims never exceeded 20 or so, contrary to the hundreds and thousands mentioned in many printed sources.” Boris Volodarsky is referring here to the false allegations made by knee-jerk anti-Soviet historians such as Robert Service. Gerry goes on to liken 1937 Barcelona to 1917 Petrograd. In Barcelona, the Republican movement was confronted by a mighty and united force led by Franco’s army and backed up by large contingents of German and Italian regular forces. Externally, the so- called Western democracies had, by their actions, declared for Franco. In Petrograd, by contrast, Lenin and the Bolsheviks faced a crumbling state machine, weakened to the point of collapse by the 1914-17 war in which over two million Russian troops were killed. In Spain in 1937, the conditions and forces to make a socialist revolution did not exist. Any attempt by the working class to take state power was sure to divide the anti-fascist movement and therefore doomed to failure. Only Franco, Hitler and Mussolini stood to benefit from such adventurism. Tom Sibley (M Star December 6) says that Orwell was a liar because he gave a more sympathetic picture of the POUM than he believed. Orwell told us what it looked like to see “the working class in the saddle” in 1936 but by December 1938 he really was a “turncoat”. He referred to the torture methods of the GPU as fascistic, so Stalinism was as bad as fascism, a reactionary position that no real socialist could accept. Franco’s coup on 17 and 18 July 1936 was answered by the Anarchist FAI-CNT and ex-Trotskyist POUM militias who lost thousands storming barracks in Madrid, Barcelona and Valencia. They defeated the army; dual power and revolution had begun, as powerfully as February 1917 in Petrograd. Foremost in showing how to fight fascism was the CNT/FAI Durruti column who knew a civil war is essentially political and not just military; that to mobilise their own ranks and to win over worker and peasants from the fascists a programme of the land and the factories to those that worked them was needed. But Durruti could not advance on Saragossa on the Aragon front because he only had old Mauser rifles, all the best Soviet weaponry were kept to crush the revolution. The May Days in Barcelona was to reverse that working-class power; police chief Rodriguez Sala attacked the Barcelona telephone exchange, in the hands of the workers of the CNT and UGT trade union since the revolution. After May 1937 the heart went out of the antifascist fight, defeat followed defeat; the adventurism was refusing to make a revolution that begged. Franco’s victory became inevitable after that and so was the slaughter of WWII. If revolution had triumphed there the French, British and German working classes might have rallied to it. This is really too much, Gerry! By providing huge numbers of arms and equipment to the legal Spanish Republic, the Soviet Union risked being in even greater danger of the Western world uniting against it to help German and Italian fascism invade the Land of the October Revolution. Despite this, the Soviets sent in the arms and equipment on a large scale and organised the International Brigade of 40,000 men. In that 1936-39 period, the British, French and US imperialists were seriously thinking about helping fascism to crush communism even more than they were already doing by stopping arms getting to the Spanish republic (under a fake ‘even handed approach’). Franco was hugely supported by full-time German and Italian soldiers and Dornier and Stuka bombing runs. Anarchism had already shown its rotten role in serious world struggle in the Green army counter-revolution by the anarchists during the Russian civil war. No serious revolutionary would support such unstable politics. Ditto Trotskyism, since the USSR had never been so inspiring in its stand for socialism against the hostile and Depression-ridden 1930s capitalist world as it was then, and all Trotsky was doing was being a gadfly of anti-Sovietism, posturing mightily from Mexico. His parties were riddled with OSS/CIA/FBI agents, since such politics during such volatile times suited imperialism to the core: “I’m for socialism, but I first want to overthrow the Soviet leadership because Stalin is as bad as Hitler” (see Trotsky’s Stalin – Hitler’s quartermaster and his book Revolution Betrayed for the full nastiness). The strategy and tactics pursued by the international communist movement led by Moscow revisionism could certainly be looked at again and again, but first a proper realistic and historic context should be given, along the lines provided by Tom Sibley. No easy revolutionary win was on the cards – it is a nonsense put out to bash the communist movement on the head with – just a pipe-dream. The Trotskyists and POUM were adventurists – and, from bitter experience, the pro-Soviet forces would have every reason to distrust any line of march they took – including sudden risings behind the Republican front line against Franco. And Lenin’s brilliant dialectical tactics during the course of the year 1917 do suggest what a correct Leninist strategy would have been in the Spanish Civil War. In summer 1917, when the Cossack general Kornilov launched his attempt to retake Petrograd from the February revolution, Lenin said the Bolshevik-led militias had to fight alongside the Kerensky forces to DEFEAT THE MAIN ENEMY while giving NO SUPPORT to Kerensky. That accomplished, they then went on to triumph in the October Revolution. Lenin’s “no support” line may or may not have been possible, given the extraordinarily precarious circumstances – and certainly the Moscow leadership must have been deeply concerned about provoking worse reaction from the USA and Britain. By fighting to assist the legal Spanish Republic against the main Franco fascist enemy, the Soviet Union and the International Brigade may well have been doing the best that could be done, and that would PERHAPS – if the Republican forces had prevailed (which for reasons outlined above was a bloody long shot) – opened the possibility of separating out the proletarian forces and pro-communist forces from the middle-class Republicans and building up a socialist revolution. To turn the heroic support of the USSR for the anti-fascist forces in the Spanish Civil War into a Soviet crime against the revolution takes some beating for sectarian subjectivism. It is because it is so sick that the capitalist film industry had no trouble supporting and promoting the Ken Loach film “Land and Freedom” which presents this scabby mythology. And using George Orwell as an authority for the truth about the Spanish Civil War really is insane if you know his real anti-communist, police fink record for the BBC and MI5. The line that “well, he may have gone to the dark side but only because he was upset by the killing of Bolsheviks by Stalin” is equally nutty. Orwell went from colonial administrator, to paid-BBC anti-Soviet propagandist, to agent for the British imperialist spying services. This source is beyond tainted! He was ALWAYS an anti-communist stooge. Trotsky has a similar rotten record of subjective chicanery – see Lenin vs Trotsky books produced by Progress Publishers – or find the numerous comments about what a fraud Trotsky was in Lenin’s Collected Works, especially on Permanent Revolution, Trotsky’s factionalising (all the time!) and socialism in one country (Lenin’s line). Trotsky ONLY intermittently played a decent role in the Russian Revolution UNDER LENIN. So hardly surprisingly, rather than seeing the Hitler-Stalin pact as a brilliant diplomatic coup that SPLIT the USSR’s imperialist enemies and bought time for the USSR’s war preparations, Trotsky just devolves to vicious petty-bourgeois moralising in 1939 and declares a complete equivalence between Hitler and Stalin – which happened to be the Fleet Street line of the time. But back to the Spanish Civil War, and it is beyond a bit rich for the modern Trotskyist tradition to be slagging off Moscow for an “easy victory lost” in Spain 1936-39 when, under absolutely no pressure from rampant Hitler-Mussolini fascism in 2017 (and for all decades prior), the modern Trotskyist parties spend ALL THEIR TIME buttering up the social-democratic racist-imperialist bourgeois Labour Party (or Democrats in the USA), rather than building pro-workers state forces to fight for communist revolution. And while the Third International clearly spread demoralisation through its dunderheaded permanent Popular Frontist politics, the prime strategic fight had to be DEFEAT for the MAIN ENEMY Franco fascist forces in the Spanish Civil War. The argument with them had to be to return to Lenin’s Marxist dialectical understanding and tactics – but even if Lenin himself had led the progressive forces in the Spanish Civil War there is hardly any guarantee that they would have won, or that the possibility of socialist revolution would have opened up. It was one of the darkest moments in all human history, and the light only glimmered again after Stalingrad. The republicans were the political shadow of the petite bourgeoisie and the comunists were led by bourgeois politicians with very scarse actual base other than deluded worker’s. The absolute main troups of the “Republic” were worker’s, employees and peasants. Anarchists dirigents were fully wrong in participating into the bourgeois governement (they have made later a full auto critic of that politics) but Buenaventura Durruti and the anarchists worker’s were very near what it was needed for, the social changes that were needed to win the revolution. The slogan of the PCE was “win the war first”. That is directly counter revolutionary and you should know it (In China without the Agrarian Reform and the insurrection of the peasants the revolution could have not been make). In Chile that I know better, the PCCH has given the same tactic. When Allende win the elections they call for “aumentar la produccion” (to rise the output, the production in lands and works ) and they opposed the strong tendancy of worker’s and peasants to occupy the works and the lands. The masses just don’t pay attention to that and continue the fight for more. Two year later they went to the extreme of trying to pass a law that would return almost all the lands and many industries to the bosses, because they were confidents in an “alliance with the medium layers” to “consolidate the process”. Here we can see a political continuity “not to bother the medium class to win them against imperialism and big bourgeoisie”. For that they even, fear to the outmost every real fight of the working class and do strictly nothing to defend themselves face to a coup that was seen by everybody six months in advance, at least. Well, as you know that failed miserably because the “médium layers” are bourgeois layers that fears mostly the rise and awekening of the working class. Also the “medium class partys in Chile” were the shadow of the middle classes which were first hesitants, but when they saw the rise of the working class, passed as a whole to the camp of bourgeoisie and constituted theirs marching troups. The Allende government, as the Spanish bourgeois led government with the help of anarchists (not Durruti) and the PCE followed the same path…to the bourgeois slaughterhouse. The POUM I know very little of them. Trotskist were very few and I know not almost all of them and less what were the diferences with the POUM. When and where Lenin could have recomended to follow a shallow bourgeois government with a bourgeois program and putting aside the social transformations that only could rise the enthousiasm and the fighting spirit of the masses? The kerensky-Kornilov exemple is just absurd. Lenin said that it was NOT a support of the Kerensky government but a tactical provisoire step. We can have a joint fight by the side of a bourgeois party, but for an specific fight or problem. Never a compromise to govern a State. That would be pure menchevism treason. The Trotsky critic is absolutely correct on this question as far as I can see…and as hard an experiency of the Staline politics I have. What we needed, as all the left wing of the Popular Union claimed was to go further with the taken of the land an of the works, repressing the conpiracies and plots of the bourgeoise, to prepare for a fight that was so evident and not to capitulate before an abstract legal process (or “Republic”) that the bourgeois respected not, and not at all. Otherwise I have never read that Trotsky egalize Staline and Hitler, on the contrary I have read that he oposed such vision. SF don’t do it. I have never find such non sens on “the betrayed revolution ” but a clear marxist leninist exposition of what happened in URSS. Could you quote? Staline, after some hesitations, sold arms to the Republic but not to the worker’s in iinsurrection, but to the “loyalists” as Casado (which with his “coup d’état” gave the final blow to the bourgeois-PCE government) against the gold of the Spanish Bank. Why not if it was made in the interests of a poor state, but very less justified in the name of proletarian internationalism. Or at least I conceived this way. Of course the Ribentropp- Molotov was a good tactical move coming from a threatened state. It have should have been presented like this. Lenin never talk of a triumph when he was obliged to sign Brest-Litovsk. But it was not a “triumph” of the working class to be forced to pass a political, economic, and “diplomatic” (with some secret clauses against other peoples and nations) agreement with the nazies. The Pact correspond to the national interests of Russia but not of communism. Albeit you make a whole between the interest of the Soviet State and the ionterest of comunism. I think that that was the case those days (before and after also) and the U-turns the comunist partys make, with some crisis, shows the deformation Staline impose to the comunist movement aroud the world. This subordination to the interests of the Soviet State goes further to the end and has marked also the end of the comunists partys. Of course, the majority of trotskists have made not their way and they must change theirs tactics and in many cases their general vision (if “trotskists” has any meaninig other than a right, a center and a left wing) but that is no reason to deform facts and political conclusions. No, surely the absurdity, Viriato, is arguing this way. The October Revolution was won precisely because Lenin’s flexibility of thinking and mastery of tactics meant he dialectically saw the need to fight the MAIN ENEMY Kornilov – who would have WIPED OUT the entire Petrograd revolutionary proletariat IF he could have done – by fighting alongside the Kerensky-led forces without giving support to Kerensky. Lenin always argued that it was for the revolutionary proletariat to overthrow Kerensky LATER, when the fascist Cossack general was defeated. This is exactly analogous to the Spanish Communists saying in the Spanish Civil War “Win the war first!”, and for the reasons I (and others) described above. Viriato also praises the anarchists for their actions, which is ridiculous – also for the reasons decribed above by myself and others. Marxism forged itself under Marx and Engels in the struggles with Bakunin and other anarchists – and routed them from the workers movement – for a long time. But periodically, because of the sick futility of social-democratic politics and the block-headed support for popular frontism by the revisionist CPs, anarchism and anti-communist, anti-Leninist disunity becomes rampant. But anarchism is so juvenile and vacuous that it springs up like a mushroom, like Occupy, before falling down again into a mess of confusion and anti-leadership backwardness. How is capitalism in a modern state to be defeated without a well-trained Marxist and Leninist leadership? It is simply not possible. How would the dictatorship of the proletariat be led and defended? Anarchists don’t want this and are as scared of the workers state in history as any other petty-bourgeois-minded right-winger – unless they change their minds from experience of Marxist-Leninist leadership. Otherwise, they will disappear up their own backsides. And much, much more and worse – all intended the convince the reader that the Soviet Union is on its last legs, a totalitarian hellhole – either about to be overthrown by a deceived working class and peasantry or to be over-run and decimated by a quick and easy win blitzkrieg by German imperialism. Gerry Downing should also look at these passages above from Chapter 11 of Revolution Betrayed. As for Trotsky’s comments about a “democracy of producers and consumers” – which exalts the Western bourgeois ideology of “democracy” – that is total ideological treachery and anarchism. In reality, in 1941-45, the USSR produced vast amounts of advanced military equipment including the Yak fighter, the T34 tank and the Katayuska rocket launcher. As Lenin explains, bureaucratic practices clearly have their problems, but the ONLY WAY for socialism to prevail in a world of hostile capitalist-imperialism is for the Soviet state to STRENGTHEN and STRENGTHEN. The withering away of the state comes much, much later when capitalism has been defeated on a world-historic scale, and possibly for 100 years or so. 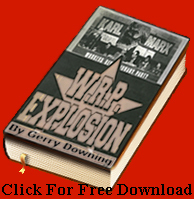 See also the EPSR (ILWP) book against Trotsky available on epsr.org.uk, “Lenin’s arguments for a strong socialist state against Trotsky’s permanent counter-revolution”. Instead of an analysis of the real Spanish Civil War, you quote sentences from the books . That’s why these so called “marxist-leninist” are where they are today. Pure abstract dogmatism. First: Revolution Betrayed is one of the best, if not the best, description of the whole process in URSS and of it’s continuation till 1989. If you read it with a minimum of critical spirit, and if your are honest, you will arrive to this conclusion. Second: Anarchists in Spain were the proletarian party. There were a reformist wing an a truly proletarian one “Los amigos de Durruti”. But they were in the whole THE proletarian party of the Spanish Revolution and with the support of the fighting working class of Spain. Poumists were at best auxiliary forces and trotskists, non existent but only in theoretical writtings pehaps some individual with no real influence. The Communist party of Spain, composed by petit-bourgeois, played, from before the beginning a provocative and counter revolutionary rol. Codevilla and Marty prepared themselves before the electoral triumpf of the Popular Front to fight the anarchists and the “trotskists” (the POUM)” as their main objective. As they report to Moscow The PCE was led by Codovilla, an argentinian “comunist” bourgeois well known to latin americans and the PSUC by Erno Gerö. The 17th july when the anarchists prepared themsslves to fight the “sublevación” franquiste, le Comintern “councel” de direction of the PCEin this way: ” It is needed that you take preventive measures, with the outmost urgency, against the putsch’s intentions coming from the anarchists, (because) behind them the fascists are hidden”. an openly counter revolutionary counsel against one of the most combat prepared forces of the proletariat. This is pure esquirol work. “It would be a fatal error. Then, we said: we are working (acting) uder the flag of the Republic…In other words, comrades, we believe that, ion the present international situation it is useful and needed for uns to conduct a policy that can preserve the oportunity we have to organise, educate, unifie the masses and reinforce our own positions in a number of countries Spain, France, Belgium, etc. where there are goverrnements that depend on the Popular Front and where the comunists partys have big oportunitues. When we have fortified our positions, then we can go further”. If this is not pure menchevism, what it is? Fight anarchists, Poumists and the proletarian dictatorship, to pactise with Azaña, Largo Caballero and other bourgeois republicains, in the middle of a proletarian upsurge, what is it? “Ganar la guerra primero” is a counter revolutionary stalinist slogan that commes directly from the above quotation. “Strenghen the state”, this is not quite an historic slogan but a very today one. I have heard Domenico Losurdo, the stalinist philosopher, tell in a conference (against my staunch oposition) that “Lenin was in this wrong and Staline right”. “That the proletarian dictatorship would be streghtened further and further more” This so-called “philosopher” doesn’t know the ABC of marxism but the ones who follow him, repeat all the non sens he sputs. Yours “Lenin’s arguments for a strong socialist state against Trotsky’s permanent counter-revolution” should go on the same roten line. Please read the Betrayed Revolution and you will find the clue to this “enigma”. I’ve just quoted to Viriato from Trotsky’s Revolution Betrayed, and the words there are enough to show that Trotsky is a total subjective anti-communist. Is Viriato or anyone else disputing that these are indeed Trotsky’s own words? Look at Chapter 11 of Revolution Betrayed, and consider the vicious petty-bourgeois subjective malice, reflected in the book’s very title. Then consider that Viriato – by his own admission – is a complete sympathiser with anarchism. So Viriato is not a Leninist at all. Instead of writting non-sens, please read “The Spanish civil War” by Antony Beevor. There you can have a look on the question. Talking phrases taken from bad books is useless. Myself is of any importance and what I think or believe neither. That was a big tragedie, a counter revolutionnary crime of the stalinists, anarchists were (with the honorable exception of Durrti, Asencio, the left wing of them as “los amigos de Durruti”) the proof of what is not to be done, trotskists, as ever, making good analysis but out of the scene and killed by Staline. That was a real tragedy and it should be adressed seriously, what you do not. Perhaps you have never been in an truly historic moment, never seen comrades fall because of faulse politics, but this epic tragedy, this compendium concentration of politics as the Civil War in Spain is, is a hard, cruel, profound lesson for worker’s with some class conciousness. Please, study the whole thing and you will agree with Trotsky.